While many collectors are familiar with the M101-4 and M101-5 cards issued by publisher Felix Mendelsohn with an assortment of advertising backs, until the past several years the larger M101-6 premiums remained nothing more than a companion piece enjoyed by advanced collectors. 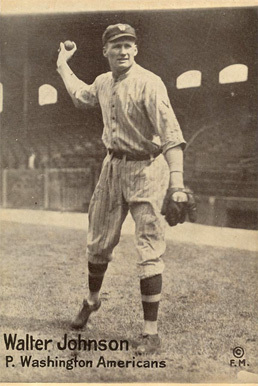 In the March 2001 MastroNet auction, a raw Babe Ruth (NY) described as being in EX condition sold for $1,321. However, once PSA and SGC developed a holder large enough to accommodate the set, prices truly begin to soar. In REA‘s 2007 auction a Ruth (NY) graded SGC 50 sold for $5,287.50 while that same year in MastroNet’s December auction one graded SGC 40 sold for $3,876. In 2008, a Ruth (NY) graded SGC 30 sold for $2,880 in Legendary‘s February auction. 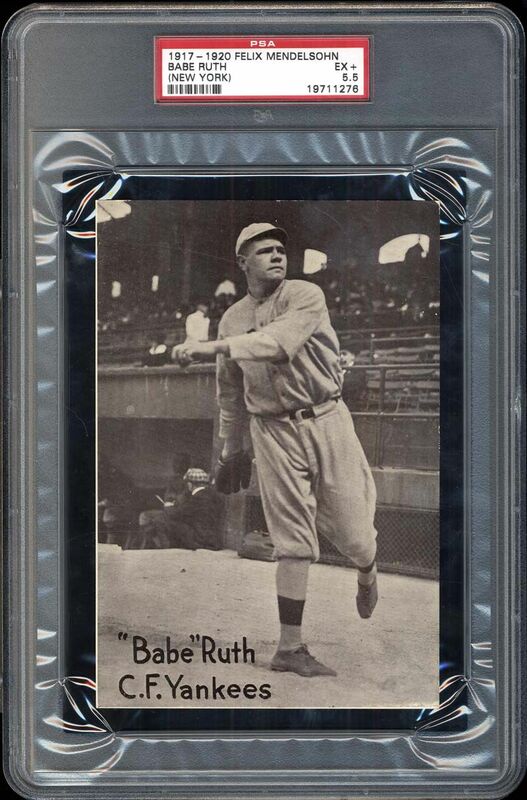 In Legendary’s August 2010 auction, a Ruth (Boston) version graded 2 by PSA sold for $22,215. 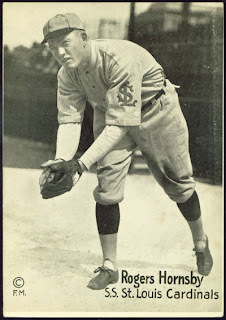 Despite the fact collectors had several years to order the Red Sox version of Ruth, during which time he was a popular player and world champion, it is considered scarce when compared to the Yankees incarnation. Over the past two years the card has truly left the ballpark like one of Ruth’s monstrous homers. In May 2012 the Mile High Card Co. auctioned a Ruth (NY) graded PSA 5.5 for an incredible $44,265.25, followed by the SGC 40 sold in Legendary’s August auction for $16,730. That last sale represented an increase of almost $13,000 in just five years. Just last month Goodwin & Co. auctioned a Ruth (NY) in poor condition, with prominent pinhole, for $16,558.85. With the rise in Ruth other Hall of Famers have followed suit. In October 2012 Goodwin & Co. auctioned a Ty Cobb graded 2.5 PSA that sold for $19,893, and in REA’s 2013 auction one sold graded SGC 10 sold for a respectable $5,925, despite the prominent pinhole. In Goodwin & Co.’s November 2012 auction, featured a pair of Hall of Fame players graded 2.5 by PSA; Tris Speaker closed at $2,249.10 and Eddie Collins slightly better at $2,474.01. The real surprise has been the common players, who longtime collector Tim Newcomb lamented at this past National Sports Collectors Convention could once be had for below $100. Recent sales have exceeded $300, even in fair condition, and no auction house has seemed to have benefited more than Dave Schrader’s Baggers Auctions, which has auctioned several common and semi-star players over the past year. Jeff Drum has been collecting M101-6 for a decade and has noted the increase in prices and popularity. Gone are days such as February 2004 when Matt Sears sought information on a M101-6 example of iconic Black Sox player Buck Weaver he described as being in VG/EX condition, and was advised it was valued between $75 and $100. This issue is clearly one of the hottest sets of the past year. While Mendelsohns rarely show up on eBay, you can see over 200 M101-4 and M101-5 cards on eBay here .